Easter is a time for family, whether or not it’s with immediate family or extended family. 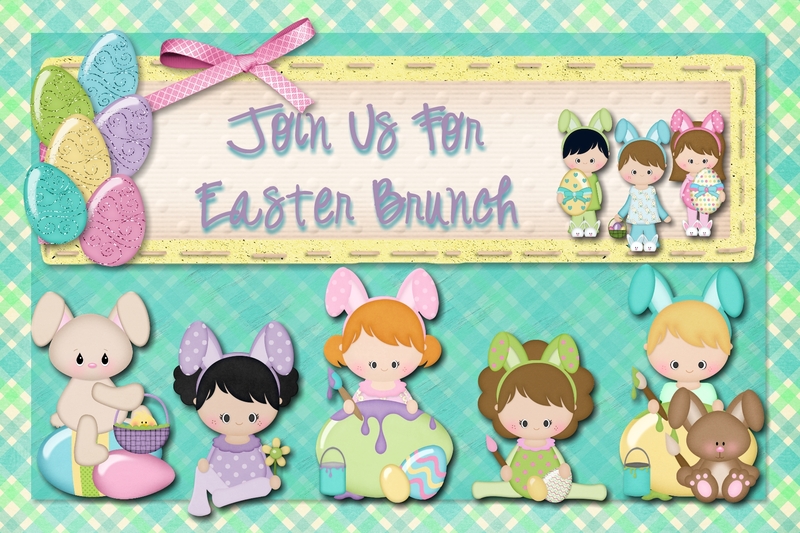 A perfect way to get together with family is to get together for an Easter Brunch. It’s easier than a full course spread for dinner, both in set up and in cooking. Once you decide that a brunch is the way you want to go, planning comes before everything else. There are three areas you want to focus on: the Food, the Guests and the Supporting Characters. As you start planning, consider who is coming and where they are coming from. At Easter, many people attend Easter Morning Services. I know for my church, our services are at 8:30am and last about an hour. My family comes from 30 minutes to an hour away and my aunt is not a morning person. Looking at all these factors helps determine when you will hold your brunch. In our family’s case, these factors determined that 11:00am would be the best time. Plenty of time for me to get back from church to cook and prepare as well as making accommodations for other plans family may have. Here’s a Tip: If you don’t want people to linger too long, consider putting an end time on your invitation. Not only does this give people an indicator of how long the event will be and the subtle hint as to an exit but it also allows others to plan for other family events…in laws. Once I had an idea of the time and the guests I would be inviting, I needed an invitation. You have a few chooses when considering an invitation. There is the traditional route of a card and RSVP. There is a personal invite that you can do via phone or well in person. Then there is the email invitation. For my brunch, I opted for the email invitation. But I never do a simple and plan invitation even if it is an email. So I made a cure little header in a digital scrapbook program and pasted it in. Here’s a Tip: Even if its family, its always a good idea to put every detail in it – address, time and date, RSVP deadline and if they should bring something. Trust me, I have left off these items before and had family not let me know they were coming, ask where and so much more. Figuring out the guest list first helps with planning the food. Knowing who is invited helps determine whether or not to avoid onion bagels because someone is allergic or to make sure to include family traditional goodies that your cousin can’t have Easter without. In my families case, people are allergic to nuts, tomatoes, bell peppers, onions, pineapple and cranberries…making salads in our family is tough. But this did help me determine what I would be serving. I also didn’t want to carry the whole burden of breakfast but there are just certain breakfast foods that need to be cooked and served immediately. So I opted to let my guests know what I would be offering and asked them to bring a brunch goodie to share. As people sent their RSVPs, they also shared what they were bringing including Sangria, sausage, and baked goods. As you plan out what you want to serve and as people RSVP sharing what they are bringing, you will want to consider how much of each item you will need and when to cook what. I personally recommend making a timeline for cooking. Some things can be made the night before or even the day before, like my carrot cake. Others will need to be made that day. Fruit can be cut early and put in the fridge. Waffle mix can be made about 30mins before cooking them and can be set aside. Potatoes can be prepped and set aside until ready to fry. Bagels and toast can be cooking while you cook the scrambled eggs which need to be done last. Here’s a Tip: If you have anything warm that gets done early, I recommend heating your oven on the lowest setting. Once pre-heated, turn it off. As you finish items that need to stay warm, you can place them in the oven…make shift warming drawer. There are quite a few supporting characters in a brunch. I divide them into two categories: food related and non food related. These include the “fixings”, serving dishes, and serving ware. As I make a menu, I look at each food to decide what “fixings” they may need. Salt and pepper and butter are the obvious to me. But some people eat eggs with ketchup. Waffles need syrup and powdered sugar. Toast and bagels need cream cheese and perhaps lox if your family enjoys them. Coffee needs sugar, sweet-n-low and cream. I find it is important to consider the fixings as you plan your brunch. Here’s a Tip: To keep things cost effective, select foods that you already have fixings for. You will also want to consider what to serve everything in and on. For hot items, I needed to figure out the best way to keep them hot. For cold, a way to keep them cold and everything in between. 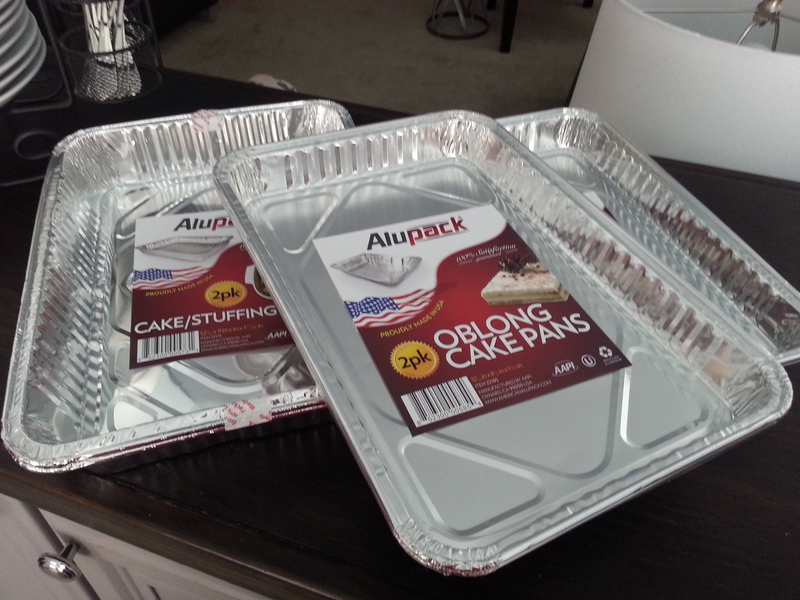 In my case, I thought the most cost effective and best way to hold items that needed to be put in my oven to keep warm were the disposable metal serving pans. Not only would the aluminum conduct heat and keep items warm, it would conduct cold to keep them cool. Plus the biggest perk, easy clean up. I found several sizes and shapes at the 99 Cent Store, so I didn’t break my bank. I decided for an extra special feel I would breakout a few of the decorative trays for the room temperature items like carrot cake. As you consider serving platters, I find its best to think in advance of serving ware for each dish. I have been to a lot of dinner parties, brunches and parties where this simple little detail was forgotten. Also, I consider what type of plates that I want people to eat off. Paper plates always make things easy for clean up as do plastic or paper cups. However, for Easter I think there is a balance between ease and nice. I opted to use solid white dishes the meal and clear glasses for beverages. Here’s a Tip: White plates help highlight the food. I must admit this is my favorite part of the whole planning of a brunch. This is the décor, the pretty. Here’s a Tip: To save time, if space permits, set up the basis of the buffet in advance. I happen to have a very long wooden counter that makes the perfect buffet area. 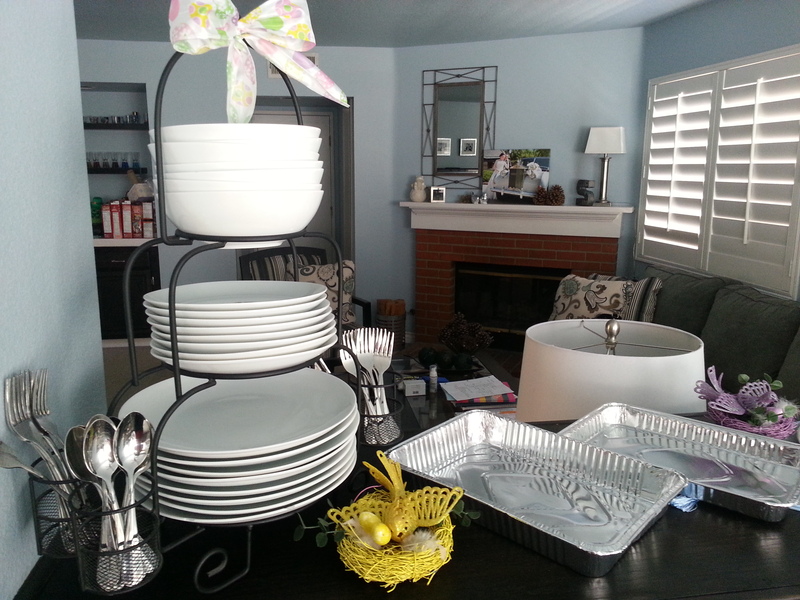 In setting up a buffet, I find it best to start with the plates and silverware at the beginning. 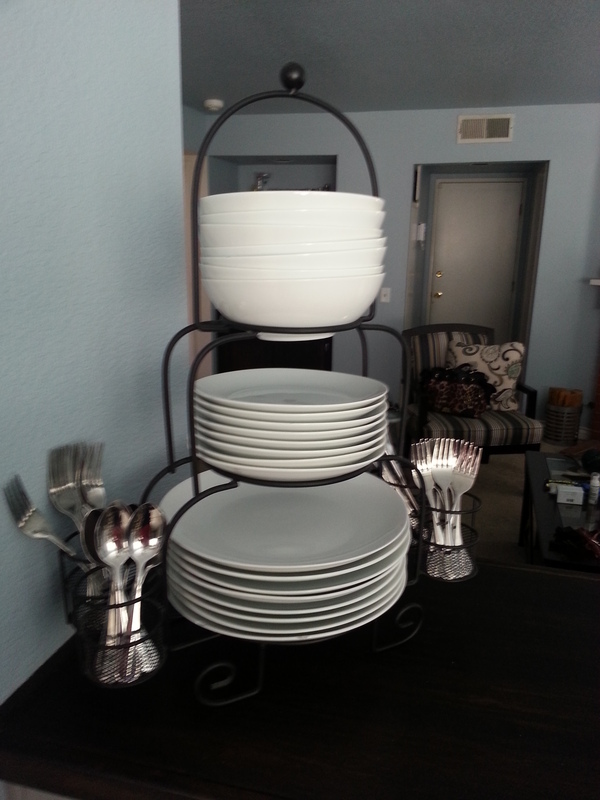 I happen to have a perfect serving stand for this that came with the dishes but you can find similar at Home Goods and Target. Then its a matter of letting your mind go wild. I personal start by putting a splash of color underneath my serving trays. I found these runners for a $1 a piece along with a cute set of bird salt and pepper shakers, again for a $1. As I set out the serving trays, I think about what is being served. I opt for hot foods and staples at the beginning like the eggs, bacon, sausage and follow with supporting elements like toast, bagels and fruit. As the Carrot Cake with provide color, I did provide a place for it dead center. Next was to add the decorative elements. I opted to continue the bird theme from the Easter Wreath, Bird’s Nest and Robin’s Eggs in the Apothecary Jar and the flower arrangement. 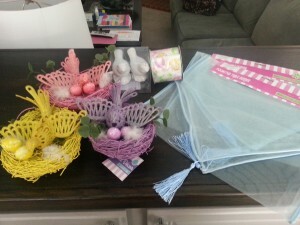 I found three colorful bird’s nest at $1 each and placed them in strategic places to add a pop of color. Here’s a Tip: I find that you can use what you have to add a fun pop of color. If you have a variety of flowers and greenery in your yard, use it to create a beautiful flower arrangement. 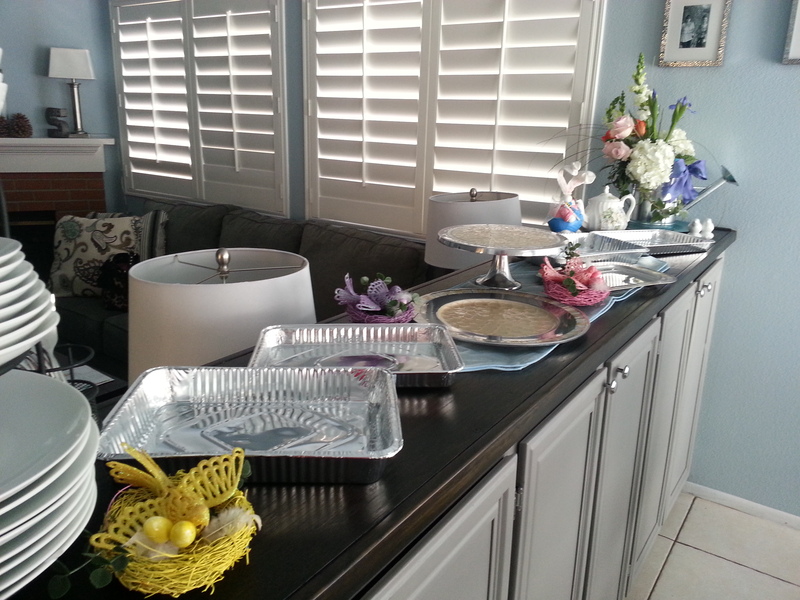 I opted to use the one I made (see this post on how you can make an easy flower arrangement) at the end of the buffet to help set the Easter tone and to add color. I hope you find these tips and my method of planning and holding a buffet helpful in planning your own. Happy Easter Brunch.